Tasty traditional haggis, made in Scotland and canned ‘whole’ within a synthetic skin. Perfect to send overseas as the canning process means it looks like traditional haggis and has the convenience of a long shelf life, there is no need for refrigeration and it is easy deliver by post. 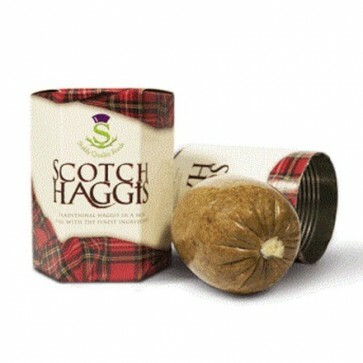 This haggis is most popular with customers in France, UK - England, Italy, Spain, Australia, Greece and Germany. This canned haggis will serve 1 to 2 people as a main meal. Easily prepared in the oven in 30 minutes or in a microwave in 4 minutes, recommended cooking times and instructions are provided on the tin. Care should be taken when piercing the skin. Serve in the traditional way with haggis, neeps and tatties or choose one of these tasty dishes.